Volume 4, Issue 2 – Spring/Summer 2016 (PDF; 2 MB) – Download the entire issue! Dawn K. Zoldi, Joseph M. Groff, and Gregory R. Speirs, State Rights . . . or Just Wrong? A Discussion of Drone Laws and National Security Through the Lens of Federal Pre-Emption, 4 NAT’L SEC. L.J. 168 (2016). John M. Bickers, Asculum Defeats: Prosecution Losses in the Military Commissions and How They Help the United States, 4 NAT’L SEC. L.J. 201 (2016). 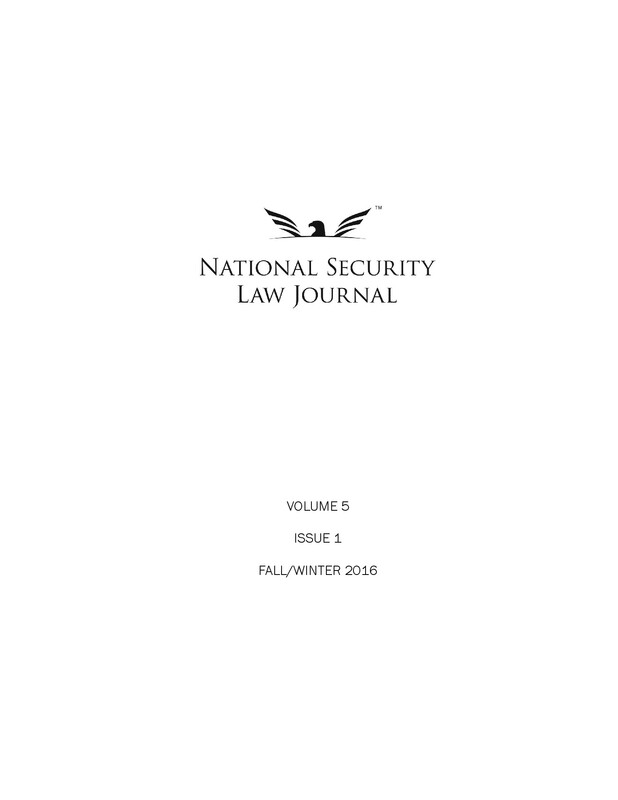 Matthew McCormack, Dr. Nicholas Rostow, and Tom Bowman, Symposium Panel, Policy By Other Means: A Review of DOD’s Law of War Manual, 4 NAT’L SEC. L.J. 259 (2016). Jameson A. Goodell, Comment, The Revival of Treason: Why Homegrown Terrorists Should Be Tried as Traitors, 4 NAT’L SEC. L.J. 311 (2016). Chelsea C. Smith, Comment, Hacking Federal Cybersecurity Legislation: Reforming Legislation to Promote the Effective Security of Federal Information Systems, 4 NAT’L SEC. L.J. 345 (2016).